BECKHOFF Automation has expanded its IP 20 I/O systems by a new generation of Bus Terminals increasing the I/O packing density. The ‘High Density’ Bus Terminals feature 16 digital channels in the housing of an electronic 12 mm terminal block. The consistent increase in the efficiency of electronics has reduced the power dissipation in the last few years to the extent that double packing density is possible today. The result is a multiple cost advantage: the space requirement in the control cabinet is reduced and the channel price drops significantly. The 16-channel terminals are available both for Beckhoff Bus Terminals and for EtherCAT Terminals. The compact 16-channel Bus Terminals offer new possibilities for project planning: the doubling of the channel density leads to a halving of the required control cabinet space, the price per channel is reduced and assembly is simplified. Miniaturisation in the field of control technology allows designers to build their machines and systems even smaller and more compact. The HD Bus Terminals with 16 connection points have identical external dimensions to existing Bus Terminals and are compatible with these. The doubling of the number of channels can be realised due to state-of-the-art contact technology and electronics. The HD Bus Terminals are available in different versions, e.g. 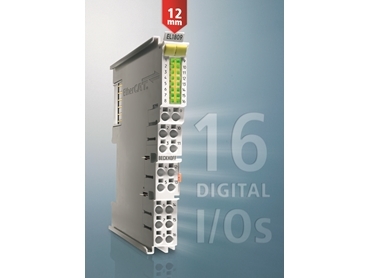 as 16-channel terminals for digital inputs or outputs, as 8-channel terminals for digital inputs or outputs with 2-wire connection or very flexible as combi terminals with eight digital inputs and eight digital outputs. Despite higher channel density, wiring is simpler due to tool-less assembly. The conductors are connected without tools for single-wire conductors using the direct plug-in technique, i.e. the cable is simply plugged into the contact point. The cables are released, as usual, using the contact release with the aid of a screwdriver. The usual colour coding for the signal types is also employed in the HD Bus Terminals. The coding is integrated into the LED display.